On March 30, nearly 300 people gathered on Olivet’s campus for the second annual Out of the Darkness Walk. The walk, sponsored by the American Foundation for Suicide Prevention (AFSP), raised awareness of suicide prevention and other mental health issues. The event raised over $11,000 and donations continue to flow in after the walk. Donations are being accepted until June 30. Olivet will use the funds to support mental health programs on campus. Donations from last year’s event helped fund the Talk Saves Lives event earlier this semester, an educational presentation about suicide prevention, presented by the AFSP. At the event, attendees learned about the scope of the issue and ways they can help prevent suicide. Events like this help spark hope in the Olivet community, and with the funds from this year’s walk, future events will continue to inspire conversation about mental health and suicide prevention. At the walk, participants wore colored honor beads to show their support for suicide prevention, commemorate lost loved ones and share their stories of personal struggles with suicide ideation or suicide attempts. Each color held a different meaning. To both Tatum and Abby, the walk had a widespread reach that touched the Olivet community as a whole. Tatum is grateful to be a part of such a powerful movement. Abby also noticed the impact the walk made on the community. Senior Shannon Dingman participated in the event last year and was eager to join the cause again in this year’s walk. 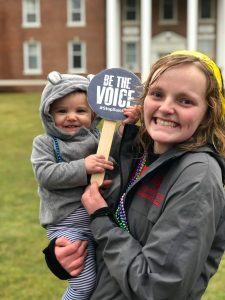 “The event never fails to make me feel not only empowered but also as if we have a voice for the ones we’ve lost, which is such as an amazing feeling,” she said. Jeremy Duby, director of bands, John Moore, Ph.D., assistant professor of psychology, and junior Abby Smith worked together to plan this year’s event. Abby and Professor Duby explain motivating factors behind their dedication to the cause. Professor Duby sees opportunities like the walk as a way to personally influence the lives of students. 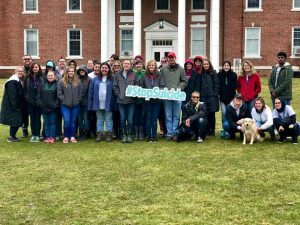 Since the first walk, the College has assembled a student mental health taskforce with the goal of using these resources to best benefit the students. Professor Moore is eager to continue making a difference at the College with funds raised from the walk. Abby’s baby goddaughter, Gabby, was at the event. Abby believes that Gabby’s generation will be the next to take up the torch and lead the charge against suicide and stigma associated with mental health issues. There’s still time to donate to the Olivet College campus walk. Donations for the event will be accepted through June 30. For more information about Olivet College, contact the Office of Admissions at 800.456.7189 or admissions@olivetcollege.edu.